A friend of mine was recently telling me about a banana bread that she makes in her bread machine that has yeast in it. She said that her family really likes it. 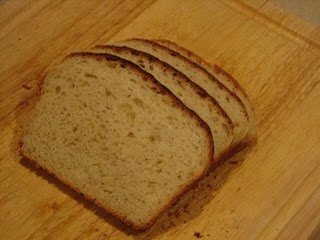 I do not use a bread machine, but I was very interested because I am always looking for new ways to use up over ripe bananas. I decided to look through my cookbooks and see if I could find a similar recipe that I could make in the oven. After I looked through a few cookbooks I found one in The Best Of Country Breads. This cookbook was published by Taste Of Home several years ago. I love this bread cookbook. Every recipe that I have tried from this book has turned out. I have made this recipe twice now and we love it. It is really good, especially toasted for breakfast. I will be making this again. I had never thought of using bananas in a recipe like this. In a large bowl, dissolve yeast in warm water. Add the bananas, sugar, milk, butter, salt, eggs and 3 cups flour. Beat on medium speed for 3 minutes. Stir in nuts. Stir in enough remaining flour to form a stiff batter. Do not knead. Spoon into two greased 9-in. x 5-in. loaf pans. Cover and let rise in a warm place until doubled, about 1-1/2 hours. Bake at 375° for 25-30 minutes or until golden brown and bread sounds hollow when tapped. Mine got a little too done on the top the first time, so if this happens, just lay a piece of foil across the top of the loaves for the last 10 or so minutes.That will help keep it from getting too brown. Remove from pans to wire racks to cool. This post linked to Ultimate Recipe Swap. I make several varieties of Banana Bread but always as a sweet bread. Never thought of it as a yeast bread. Interesting. I linked you blog to a blog friend that was wanting some good apple recipes!!! This sounds really different and good. Do you think it’s possible to make without a stand mixer? Maggie, I think you could easily make it by hand. I have a kitchen aid that I use, but this recipe could be easily make by hand since you do not really knead it. Good question. Love your website – would you mind passing on the bread machine recipe for this as well? We have one, and LOVE it – it’s so nice to throw ingredients in, and come back later for a great side to a meal!